Rachel Fricke and Alanna Greene don’t just want you to know about UW’s scientists, they want you to like them too. 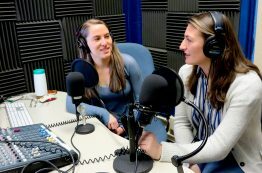 That’s what’s driving the two seniors at The UW’s School of Aquatic and Fishery Sciences to broadcast Earth Tones, a weekly podcast dedicated to showcasing University of Washington science grads and the stories naturally emerging from their research. The podcast is a labor of love for Fricke and Greene, who both believe that the human stories associated with scientific research—the personalities, pitfalls and the comedy—are often as relevant as the core findings more commonly published. 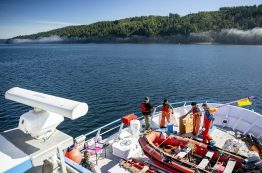 Follow Deana Crouser aboard the University of Washington’s floating lab, R/V Rachel Carson, as she studies some of Puget Sound’s smallest inhabitants and gives us a glimpse of what the future looks like for the world’s oceans. On February 20, some of the region’s most notable organizations working in environmental and natural resources—including Boeing, Port of Seattle and The Nature Conservancy—will be on-hand at the UW Environmental Career Fair! 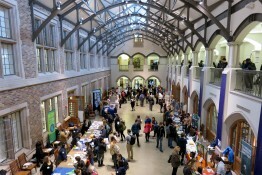 The event gives students a unique opportunity to connect with potential future employers and explore career options across the nonprofit, government, and private sectors. 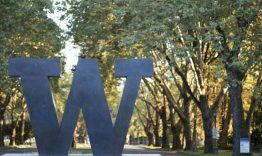 Open to UW students and alumni, this year’s fair includes working environmental professionals from more than 30 organizations in the Pacific Northwest and beyond. A new analysis by scientists from Auburn University, the University of Washington and three other collaborating institutions suggests the value of structured research programs for undergraduates extends to society as a whole by encouraging participants to seek advanced degrees in scientific and technological fields — often referred to as STEM, an acronym for science, technology, engineering and math. 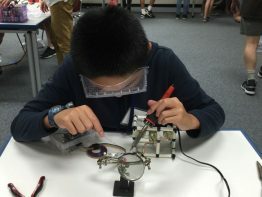 In an article published this week in the journal BioScience, the researchers reported that college undergraduates who take part in summer research training programs — specifically, in this study, the National Science Foundation’s Research Experiences for Undergraduates Sites initiative — are 48 percent more likely to pursue STEM-related doctoral degrees than demographically matched students who apply but are not selected. It is graduation season, and with that comes well wishes for our graduates and an opportunity to shine a light on their accomplishments. In appreciation of their contributions to enriching the College of the Environment in numerous ways, the College has decided to fund a project jointly with the Campus Sustainability Fund (CSF). Recognizing our students are the next generation of leaders in environmental science and decision-making, we believe this is a contribution that showcases our collective commitment to the sustainability and the well-being of our Husky Community and our planet.